The modern non-rigid kite started as a vision of Dr. Francis Rogallo, an aeronautical engineer of the National Aeronautics & Space Administration (NASA). Francis Melvin Rogallo earned one of the first Aeronautical Engineering degrees issued by a United States educational system, from Stanford University, in 1935. Following WWII, Rogallo began research on a flexible wing. 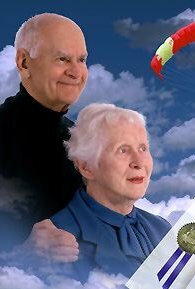 He had always been an avid kiteflyer and he believed he could develop a kite with the stability and shape of a parachute, but with the lift of an airplane wing. Prior to Dr. Rogallo’s research, it was believed that cloth had to be braced or stiffened in order to serve as a basis for flight. However, no organization was willing to subsidize such experiments at that time. His early work was done privately in his own home with the invaluable assistance from his wife and life long partner, Gertrude. 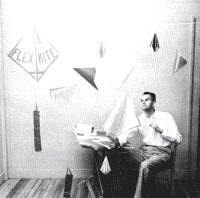 Before the end of 1948, Rogallo had succeeded in producing the first fully successful flexible-wing kite called the ‘Flexi-Kite’. A patent was applied for in 1948 and granted in 1951. As an acknowledgement of his wife’s enormous contribution to the project, Francis put the patent in his wife’s name. Gertrude holds the patent on the “Flexi-Kite”. This was not simply a tribute to Francis’ love for his wife, but the acknowledgement that she was a significant partner in his research. Gertrude cut and sewed the fabric into the required dimensions, often using household items like the kitchen curtains. Together they built larger and larger sails, and did endless hours of testing on the Outer banks of North Carolina. They took advantage of the same winds that the Wright Brothers used in their research of a half century previously. And, as is true of many of the great experimenters, the Rogallos learned as much or more from their failures as they did from their successes. However, Rogallo did not stop there. He and Gertrude continued with their research. Initially, the work was done in their own home. In order to free Rogallo from dependence on the weather, he installed a 36-inch electric fan in his house. The fan was situated in such a way as to produce a strong breeze through a doorway, providing them with a basic wind tunnel. The original flex wing kites used a windsock-like tail that doubled as a storage bag. Eventually Rogallo designed kites that only required tails in strong wind. The flex-kite held its shape with a system of shroud lines forming a multi-leg bridle. Rogallo’s early kites needed up to twenty-eight shroud lines, although their tendency to tangle convinced him of the need to design simpler models using six, and then finally four lines. These kites proved to be extremely light and efficient. They reacted to the wind pressure and formed a nearly perfect aerodynamic shape. Since they required no spars it was the first unbreakable kite and this characteristic made the flex-kite a popular toy. However, the design was destined for more serious work. Two American aircraft companies, Ryan and North America, became very interested in Rogallo’s flex wing design with a variety of uses in mind. The companies saw the immense potential for gliders, dirigible parachutes, and even a new type of manned vehicle. The first powered manned flex-wing test was completed in 1961. These tests led to the development of a ‘Fleep’, a flying jeep that works from short, rough landing surfaces and that can lift loads of almost a half of ton. The large flex-wings used in these applications have the same general configuration as the Rogallo kites, but have rigid frame members. At times these members are simply inflated cylinders of flexible material. Francis Rogallo believed that flexible wings provided more stability than fixed surfaces. He felt that aircraft or kite should conform to the flow of the wind, as opposed to the wind conforming to the form of the kite or aircraft. With his aim being to achieve minimum supporting area with maximum lift, Rogallo worked towards the total elimination of rigid spars. His concepts have been referred to as classics examples of purity and efficiency. The mid fifties saw the Soviet Union take the world by surprise as it launched its first capsule into orbit around the earth. As the United States played catch up to get it’s own craft into space, a variety of methods were tested to safely return of our space capsule. The potential of Rogallo’s theories were not overlooked by NASA and the United States space program. It wasn’t long before he was involved in extensive research at the enormous wind tunnel in Langley, Virginia, developing highly sophisticated parawings, capable of being deployed and controlled with precision for the landing of returning space capsules. However, eventually NASA needed to make a decision and the parachute won out over Rogallo’s design. During the early sixties papers written by Rogallo as well as government reports became available to the general public. The Rogallo wing was turned into an easily constructed, inexpensive, foot launchable glider, which worked well. Word of its success got out and more were built. This presented the Rogallo’s with a dilemma, whether to defend their patent or not. In an incredibly generous gesture, the Rogallo’s chose let manufacturers freely produce their invention. And to this day the people of the world continue to enjoy the fruits of their labor. It can certainly be argued that Dr. Rogallo’s most significant contribution was in the development of the famous delta wing. While this makes Rogallo the father of modern hang gliding as it is known today; for kite fliers, the importance of the delta is profound. Dual line Sport kiting is what it is today because of the delta swept wing design. It is also very possible that the ease and lack of frustration that accompanies the flying of a single-line delta kite has significantly increased the ranks of the AKA and kite clubs everywhere.